This softly glowing, elegant and resplendent figure, radiating serene compassion, is an exceptional image of Avalokiteshvara, the most revered bodhisattva in the Buddhist pantheon. Bodhisattvas are those who, due to their great compassion, forgot their own nirvana to lead others there. 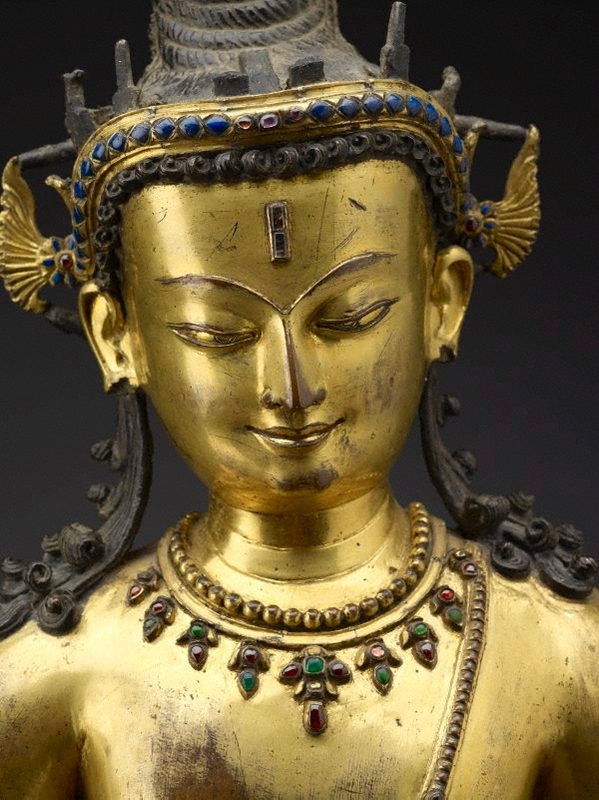 Avalokiteshvara is the Sanskrit name for this most popular bodhisattva who is identified by many names and manifested in numerous forms. Other titles bestowed on him include the Luminous Lord of Infinite Compassion, the Bodhisattva of Mercy, Padmapani (Lotus-bearer), and Lokeshvara (Lord of the World). In today’s world the Dalai Lama is viewed as a manifestation of Avalokiteshvara. Apart from being a saviour, Avalokiteshvara is revered as the protector of travellers and the giver of rain and fertility. 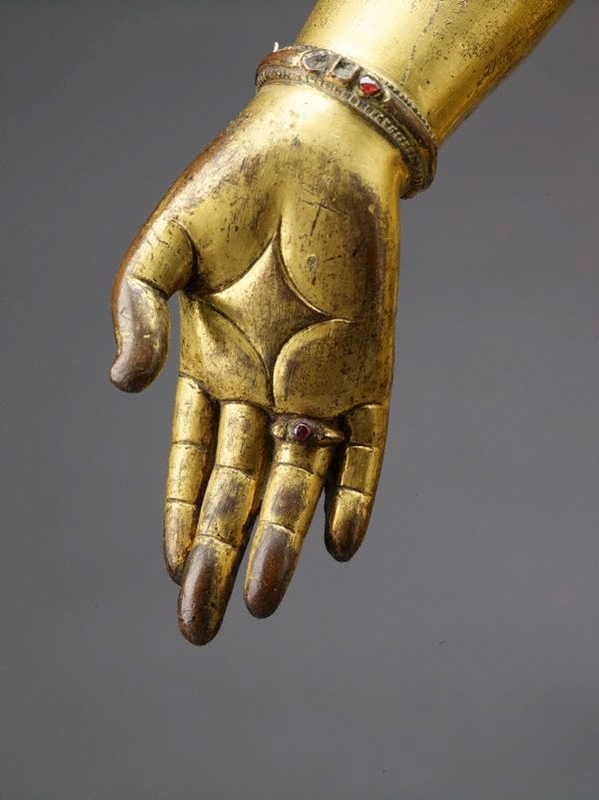 His generosity is demonstrated in the pose of his right hand which is held in the gesture (‘mudra’) of wish-granting (‘varada mudra’), here with a diamond incised in the out-turned palm. 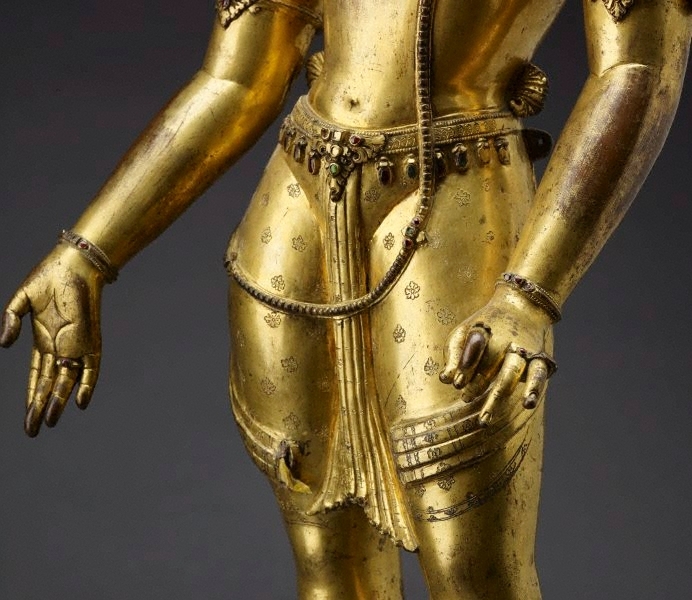 His left hand originally held the stalk of a lotus whose full blossom would have extended above his shoulder – though all that remains now is the hook on his shoulder used to attach the separately cast bloom. 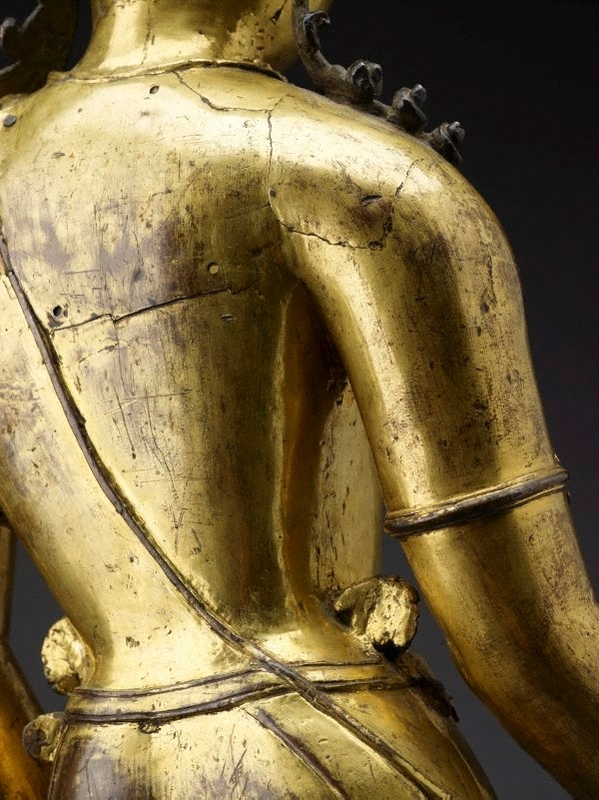 The lotus, symbol of Buddhism, that this bodhisattva carries gave him the popular epithet Lotus-bearer (Padmapani). 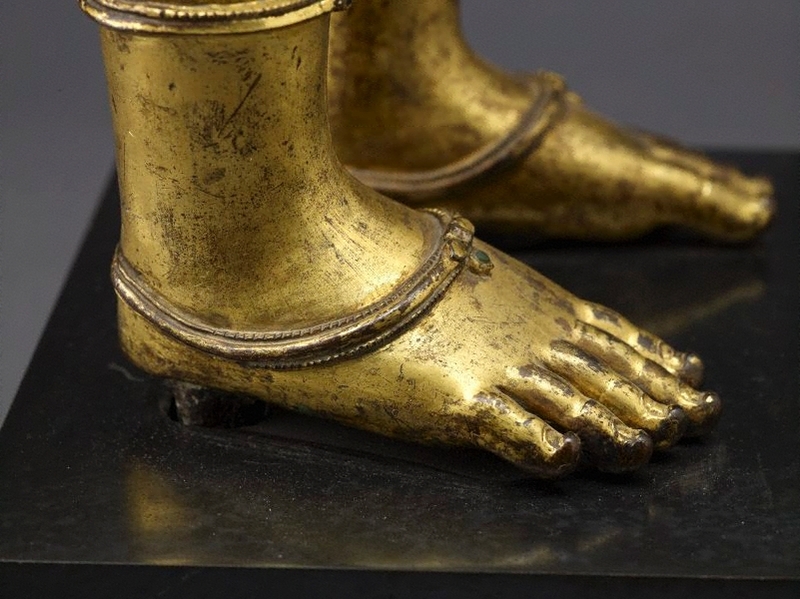 Originally, he would have stood on a base modelled as an open lotus. Avalokiteshvara is regarded as an emanation of the Buddha Amitabha who reigns over the Western Paradise of Sukhavati, the Land of Bliss. 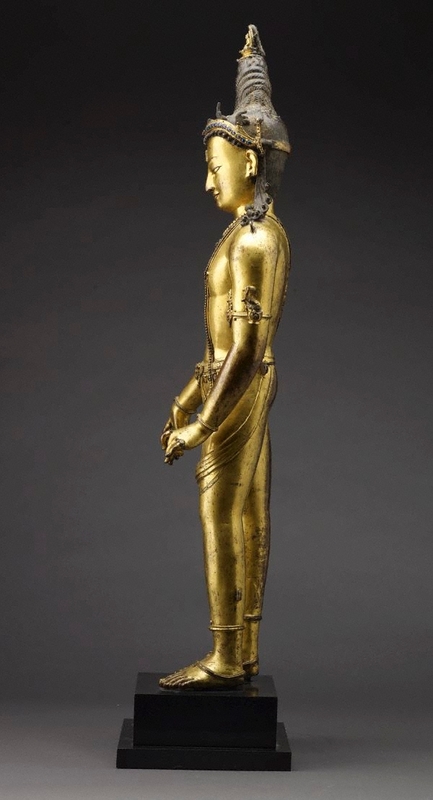 As such, he carries a small image of a seated Amitabha on the top of his tall chignon which is styled in the distinctive dreadlocks of an ascetic (known as a ‘jatakamuta’) although, paradoxically, he wears the jewels of a lord. Originally the gemstones he wore were rubies and emeralds, but over time these have been replaced with coloured glass. Buddhism, and its associated iconography, is thought to have entered the kingdom of Nepal from India in the mid-6th century. 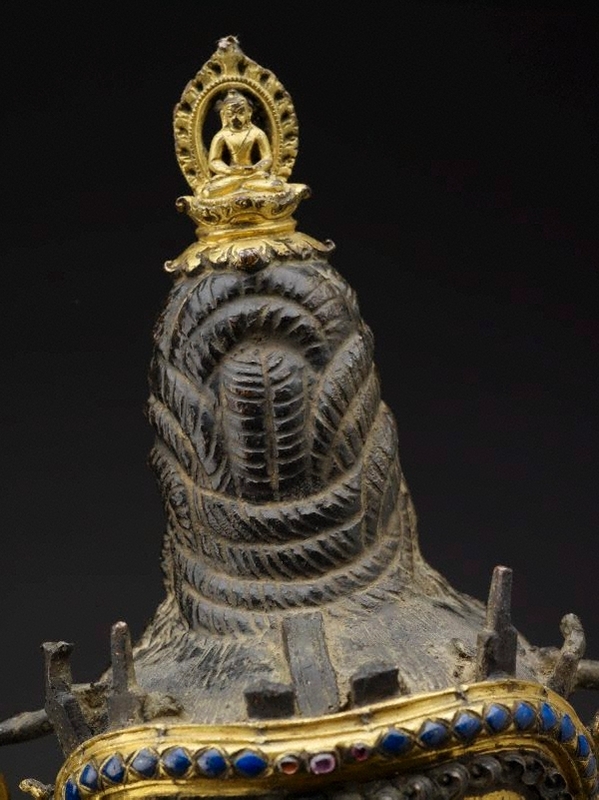 Although the iconography originated in India, Newar craftsmen of the Kathmandu valley took the sculptural expressions of Buddhism to new transcendent heights. 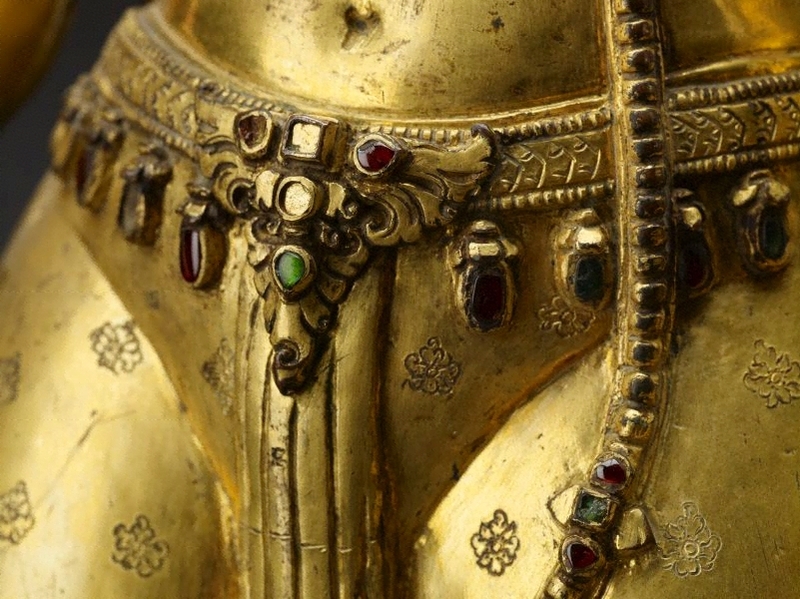 It was they who catered to the demands of both Nepalese and Tibetan temples, enjoying a special reputation in Tibet for their extraordinary skill in casting images, and even working for Tibetan patrons within Tibet itself. 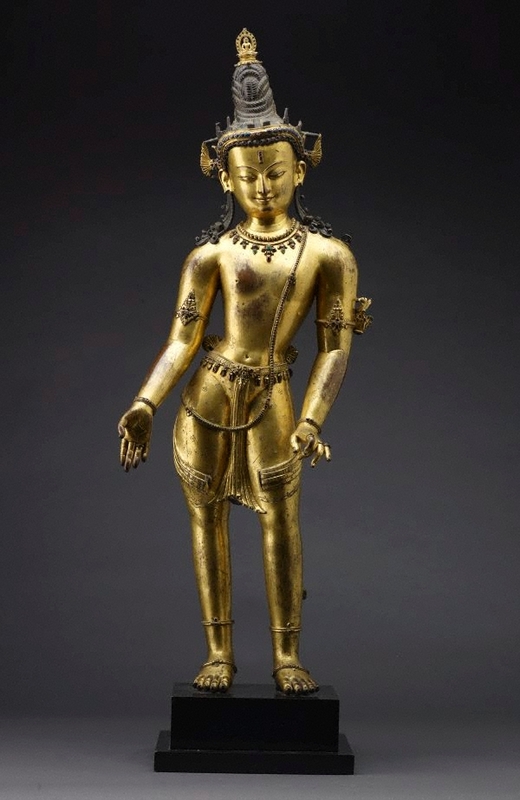 The 12th and 13th centuries are esteemed as the most accomplished period in metal casting in Nepal – when the best work, as exemplified in this figure, attained a technical and aesthetic pinnacle rarely surpassed. 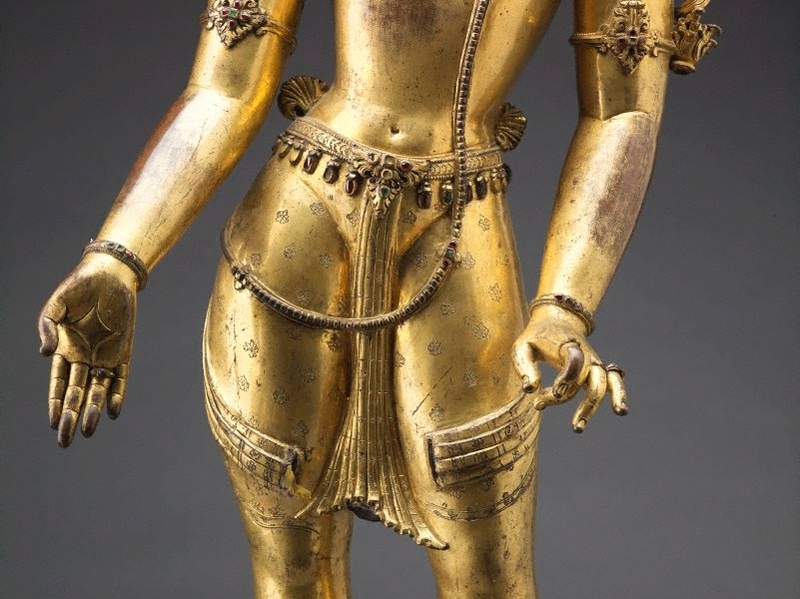 This sculpture is typical for Nepalese work in that it is made of copper, yet remarkable for being cast in one piece and exceptionally large. 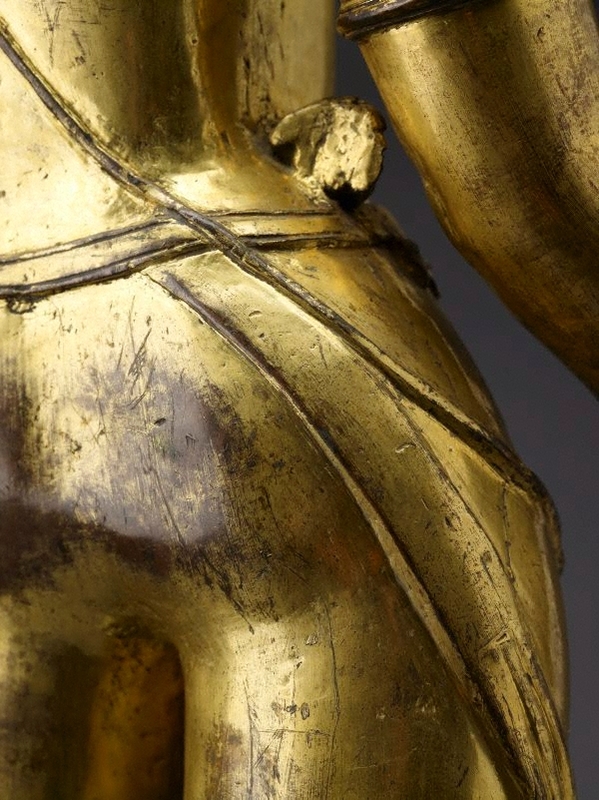 The casting technique was the lost wax (‘cire perdue’) method, after which the sculpture was finished by hand, particularly with the ornaments, before being gilded. 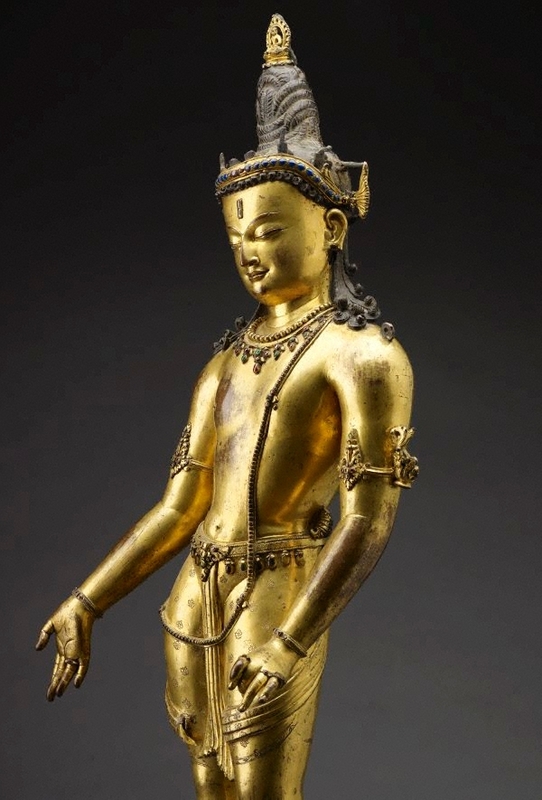 The gilding so characteristic of Buddhist metalwork accords with Buddhist textual references to the radiance emitted by the Buddha’s (and by association, Bodhisattva’s) body – a radiance that fills the universe with light. 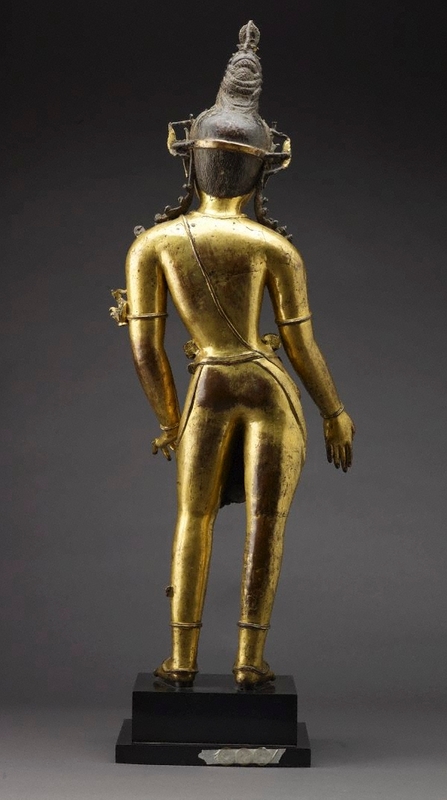 This fluidly articulated figure, undoubtedly modelled by a master sculptor of great aesthetic sensibility, is assuredly classic in its proportions and pose: it stands regally frontal, its slim, well-proportioned body gracefully posed in the classic ‘tribhanga’ (triple-bend) posture that renders rhythm and natural grace to the figure. The youthful body is subtly modelled with broad shoulders, narrow waist and slim hips; the smooth, polished skin surfaces endowed with a sensual warmth. 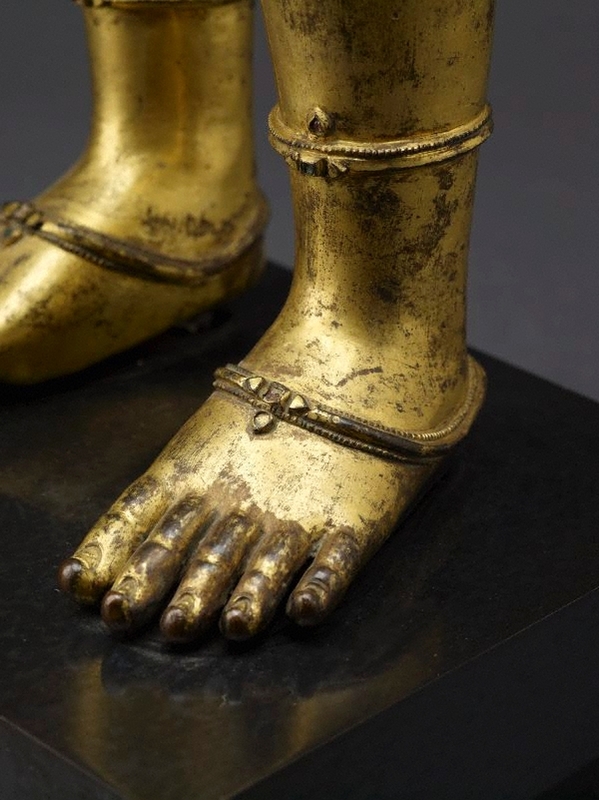 Apart from his gem-laden crown, earrings (now missing), necklaces, armlets, bracelets and anklets, and the long sacred thread (‘yajnopavita’) looped across his chest, our figure is modestly clad in a form-revealing patterned ‘dhoti’ with a generous sash that falls between his legs. His broad, sweet face, slightly tilted to one side, with soft features and wide-spaced eyes, emanates compassionate understanding, sympathy and an all-embracing spirituality. 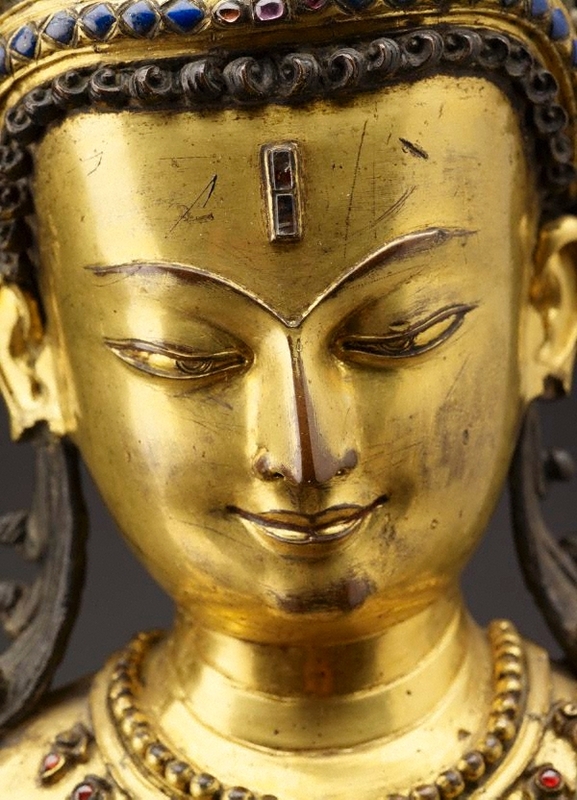 The rectangular geminset mark on his forehead reinforces his spiritual power: it is the equivalent of the ‘urna’ that appears between a buddha’s eyebrows as one of the 32 distinguishing marks of a buddha. Jackie Menzies, Look , 'The luminous lord of infinite compassion', pgs. 26-29., Sydney, Jul 2010, cover (colour illus. ), 9 (colour illus. ), 26-29 (colour illus.). The colour illus. on the cover and pages 26-29 are details of this work. John Saxby, Look , 'The director's tour. Exploring the collection with Michael Brand takes you through the heart of the Gallery, via Yirkala, Nepal and circular Quay’ interview, pg. 18-20, Sydney, Aug 2015, 18 (colour illus.). 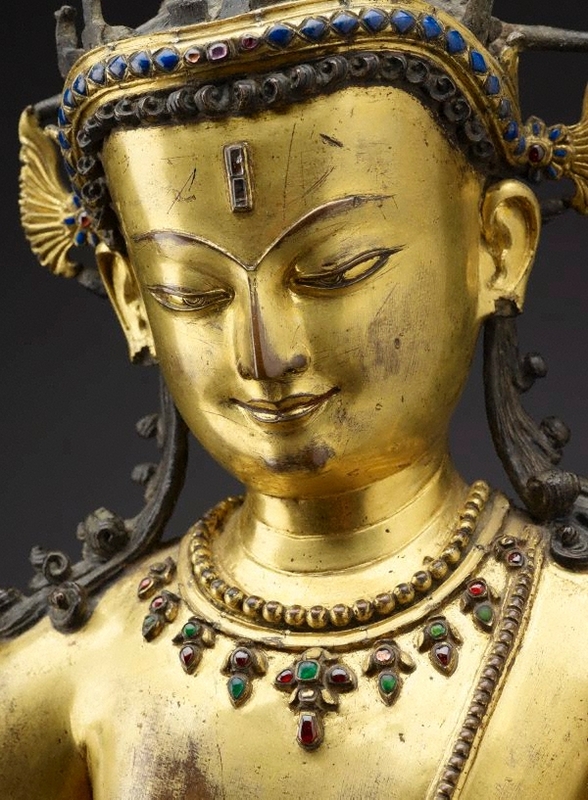 Jane Casey Singer, Buddhist art: Sculpture and paintings from India, Nepal and Tibet , 'Avalokitesvara', pg.12-13, London, Nov 1999, 13 (colour illus.). Thirty Years 1987-2016 , England, 2016, 122-125, 159 (colour illus.). The colour illus. on pages 124-125 are details of this work. Art Gallery of New South Wales annual report 2009–10 , Sydney, 2010, 7 (colour illus. ); 77 (colour illus.). The colour illus. on pg 7 is a detail of this work.